You only have one more day to enter my gift card giveaway!! Oh good intentions. I always have them. I really did mean to plant way earlier than now. Really. I even have fabulous excuses to why I didn’t. Want to hear them? Of course you do! My mother always says you shouldn’t plant vegetables until after Good Friday. Remember when Good Friday was? It was late this year, April 22. I could have planted that weekend, but I was out of town. 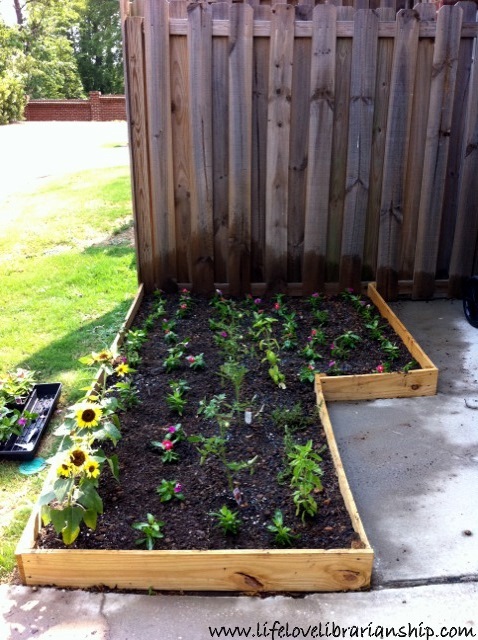 Two weeks after that, my dad and I built the sort-of raised bed I knew I would need since I don’t really have a yard. We didn’t buy enough soil to get it ready, so Dad filled it in the next weekend ,while I was away at MLA. The next weekend was taken up with family gatherings and lots of DVR watching. Face it, I’m a little lazy. Last weekend I went to see my best friend so I couldn’t plant then either. Which brings us to this weekend. And me planting, in the sweltering Alabama heat. Seriously, y’all, it was HOT. I think the heat index was above 100. BUT. I REMEMBERED TO TAKE PICTURES. This is huge. Momentous really. I took pictures and now I’m blogging about something that happened three days ago instead of three weeks ago. I should get a medal or something. What is growing in my garden you ask? I’ve got sunflowers, tomatoes (Celebrity and Big Boy), basil, rosemary, and the small flowers are vinca. A close up on my sunflowers...no Italian garden is complete without them! 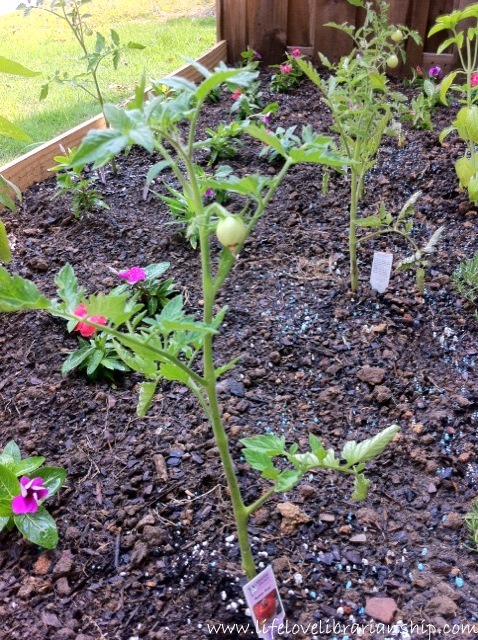 A (slightly blurry) close up on my first tomato! Where was Caty during all my hard work? Well, after she attempted to escape into the great outdoors (a BIG no no), she napped. Being a cat is so exhausting. Did you plant this year? What did you plant? Ooh, I love your garden! So pretty. I like ours but we had to put chicken wire around it on account of the dog. 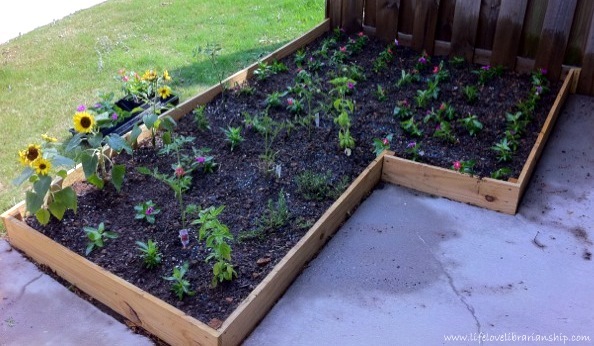 We planted a bunch of stuff…lots of tomatoes, peppers, squash, other veggies, and some herbs. We’re still deciding what flowers we want to plant in our yard. Thanks! 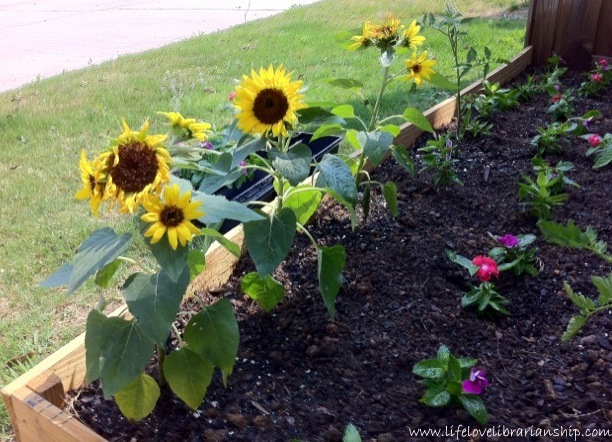 I’m really pleased with how it turned out but now my sun flowers are dying. I need to research growing them and see what I’m doing wrong. How much space does squash take? I would love to plant some next year, but I’m worried I don’t have the space. 1. Your garden is precious! 2. I love that chair!! 2. 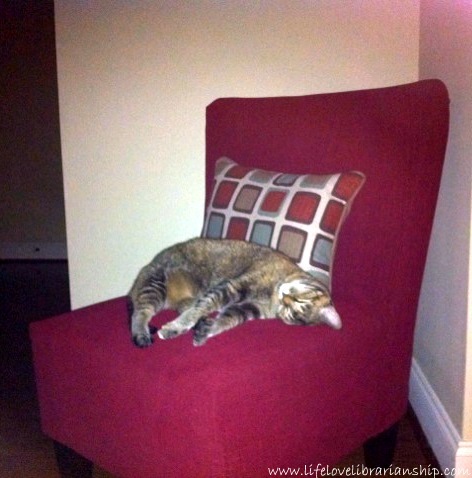 I love the chair almost as much as Caty does (lol). It’s a really pretty crimson and it’s such a fun shape. Unfortunately it’s covered in cat hair all the time so no one can sit in it, but it still looks cute.